First, let us start with some history introduce the subject. It was thanks to the discovery of Henri Becquerel in 1896 on natural radioactivity that everything began. 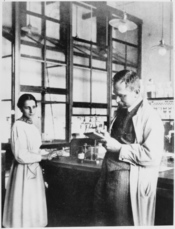 In 1898, Marie Curie discovered polonium and radium and won the Nobel Prize for Physics with Becquerel in 1903. In 1939, FrÃÂ©dÃÂ©ric Joliot-Curie discovered the chain reaction caused by nuclear fission. After all these findings it's in the Soviet Union in 1954 that the first nuclear power-plant was built to produce electricity. In the years after the construction of the first nuclear power plant, many improvements had occurred, especially in the treatment of waste, safety and energy conservation, which allowed to have plants of different generations. Nuclear Power: A nuclear reactor generates steam which turns a turbine connected to a generator that produces electricity. This steam is obtained by the heat generated by the fission of uranium atoms. Electricity is then sent through a transformer to the high-voltage lines. The uranium isotope is packed in the form of small pellets. Placed in a steel tank filled with water, these assemblies form the heart of the reactor. They are the site of the chain reaction, which leads them to high temperatures. The water in the tank is heated at contact (over 300 ÃÂ° C). It is kept under pressure to prevent boiling, and circulates in a closed circuit known as the primary circuit. WriteWork contributors. "How a nuclear power plant works" WriteWork.com. WriteWork.com, 11 October, 2014. Web. 18 Apr. 2019.